A New Book from David Zinger – E-Book Released Dec 2011! Take a bite out of work with 54 poems and 54 cartoons. 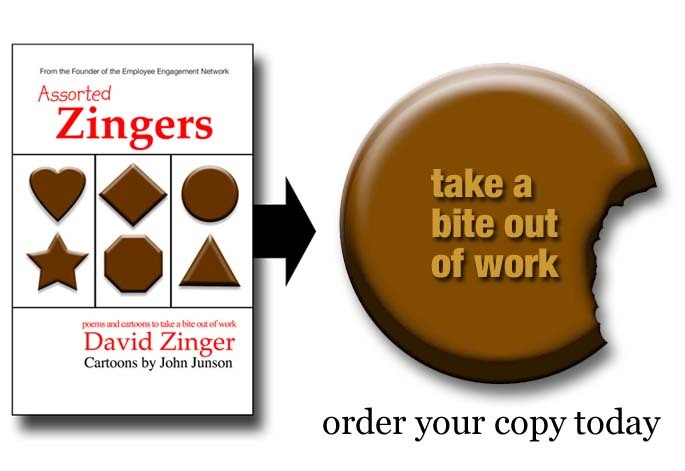 If you like reading David Zinger’s work on employee engagement, you’ll love his newest book. In addition, the book is co-authored with John Junson as they creatively weave together 54 poems and 54 cartoons into one volume. If you want to be one of the first to get the book we are offering it at 25% off the price. Sample of the book. To view a sample of the book click here. For more information or bulk orders. Contact David Zinger at zingerdj@gmail.com.